This is a new and exciting product for The Original Book Works. Combining real antlers and our faux books, this is a serious candleabra. They look sensational in a hunting lodge or on a smart dinner table. They are a large and imposing piece to impress and show off a table at its best. Due to the unique nature of the product, goods sent may differ .. Height: 340mm / 13 3/8"
The real antler candle holder is a brilliant table decoration for any special event, wedding or for festivals or Christmas. 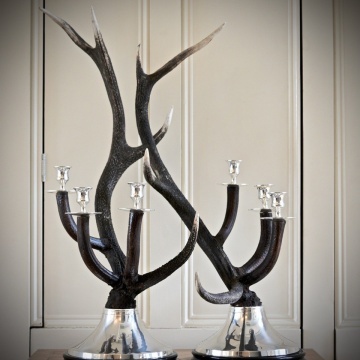 With three silver plate candle cups and holders this antler candle holder is a real conversation piece. Its shape also means that it is ideal for display on a sideboard or in a niche or alcove that needs a special feature. .. 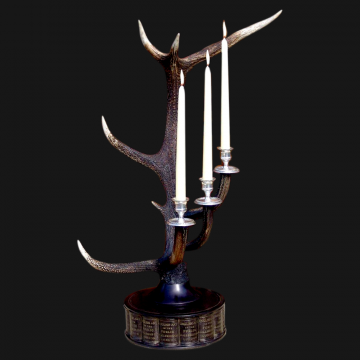 Height: 85mm / 3 3/8"
A striking candelabra made from naturally-shed antlers, mounted on a silver-plated base. 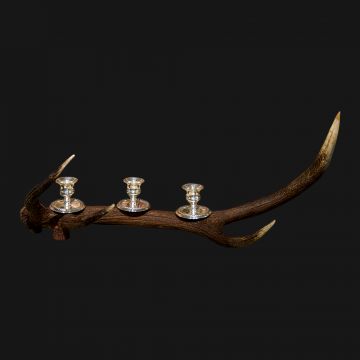 The antler has three silver-plated cups, allowing for six tapers (slim candles) in total. The silver-plating is coated to ensure tarnishing does not occur. A showstopper for the dining room, kitchen or either side of the mantle.Please note these items..